Image: Squaredpixels/Getty Images. Design: Ashley Britton/SheKnows. Every time I experience the dull throbbing that warns me a full-blown headache or migraine is on its way, my first instinct is to hide under the covers in a dark room. Of course, more often than not, this isn't a viable option (although it's certainly an appealing one). What has proven effective in the long-term is working with a doctor to identify what triggers these headaches from hell. Like anything else, not everyone will have the same triggers — but a look at the following nine causes of headaches can help identify the lifestyle choices and underlying medical issues that may be contributing. Dr. Vincent Martin, physician and professor of clinical medicine at University of Cincinnati College of Medicine, tells SheKnows that headaches can be caused by certain foods. "There is a naturally occurring compound called tyramine that has been identified as a major trigger for migraine and headache patients," Martin explains. "Tyramine-rich foods include meats, fruits and vegetables, primarily those that are aged, smoked, pickled or marinated." Other foods in this category include pickles, tofu, sauerkraut and cheeses. Dr. Niket Sonpal, practicing physician and assistant professor at Touro College of Osteopathic Medicine, says that many of his patients have very sensitive noses and certain smells can trigger headaches. "The most common smells that trigger headaches are gasoline, tobacco and floral perfume," Sonpal tells SheKnows. Braids, tight ponytails and other hairstyles that pull on your scalp cause tension in the cranium, which (you guessed it) is a surefire way to get a headache. Sonpal notes that a study conducted by researchers at The City of London Migraine Clinic found that more than half of all women experience tension headaches due to too-tight hairstyles. More: Is It Possible for Our Hair to Hurt? Dehydration is a very common trigger for headache and migraine, making it absolutely imperative that people drink water consistently throughout the day, Martin explains. Hunger is also a trigger because it causes blood sugar to drop, which can result in adrenal fatigue and muscle contractions, he adds. Ah, yes, the dreaded hangover headache. Dr. Jesse Sandhu, board certified emergency room physician and owner of Steamboat Emergency Center, tells SheKnows that it is caused by the expanding of blood vessels within the brain. Alcohol is a diuretic (which makes you urinate), and it can result in significant dehydration. "Your body responds to this by shunting your blood flow to the most important organs, including your brain," Sandhu says. "It does this by causing dilation of the blood vessels in the brain in order to increase blood flow, and [thereby causes] headache." "If you get your migraines mostly around your menses or ovulation — mid-cycle — these result from fluctuations in estrogen and progesterone," Dr. Jacob Teitelbaum, a board certified internist who specializes in treating patients with chronic pain and chronic fatigue, tells SheKnows. Progesterone is the body's "natural valium," and hormonal fluctuations can trigger changes in our brain chemistry and neurotransmitters, he adds. "These headaches are very resistant to standard treatment but respond well to giving an estrogen patch and bioidentical progesterone, Prometrium, for the week around one’s menses," Teitelbaum says. Stress can cause prolonged tightening of the muscles in the head or neck, leading to built-up tension in these muscles and headaches, Sandhu says. The glare of staring at a computer screen or being in the sun without proper optics can cause headaches according to Sandhu. "The mechanism is similar to stress, where you have a constant tightening of muscles in the forehead, eyes and neck," he explains. Whether it's from dehydration, hunger or lack of sleep, most of us get a headache every once in awhile. But if your headaches are common, incapacitating and accompanied by other symptoms, you should be assessed for migraine, a neurological condition that's the third-most prevalent illness in the world. 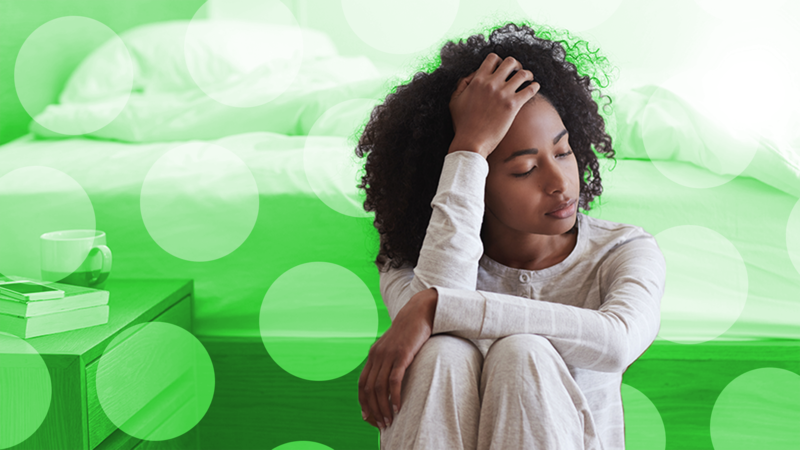 "Migraine is a chronic and episodic disorder characterized by headache attacks," Martin tells SheKnows. The condition is characterized by recurrent headaches that last anywhere between four and 72 hours; one-sided, pulsating, moderate to severe pain; and decreased ability to function in everyday situations. Martin notes that often, two of these three associated symptoms are present during an attack: nausea and/or vomiting, sensitivity to light and sensitivity to sound. Other symptoms can include pale skin, diarrhea and sweating or cold hands. If this sounds painfully familiar, it's time to check in with your doctor to be assessed for the condition. And although most of us won't be able to get rid of headaches for good, at least now we know that some of the causes are avoidable.